Sometimes, it’s the juxtapositions that give a name its air of insouciance. That’s the case with Representatives Thomas Jefferson Busby and Bolling Hall. Ah, Thomas Jefferson Busby. His name starts out with such promise, referencing a revered founding father, and then makes a dramatic switch with a last name redolent with the excess 1930s movie musical extravaganzas. In actuality, he seems to have lacked the flair of either and apparently went by “Jeff.” Busby (1884-1964) represented Mississippi in the House from March 4, 1923 to January 3, 1935, and worked as a lawyer both before and after. His most noted work during his time in Congress is the 1934 legislation he authored providing funds for a survey of the Natchez Trace, which eventually led to the construction of the Natchez Trace Parkway, which began with the survey and was finally completed in 2005. Next, Bolling Hall. It’s neither fair nor nice to snigger at a person whose name simply happens to sound like something else, especially something that probably didn’t exist when he or she was named. Nonetheless, I can’t help it: I giggle and wonder if Hall bowled inside or outside, or if he ever took a very long nap. Hall was born in Virginia in 1767 and fought in the Revolution at age 16 (now I feel even more guilty for giggling). He moved to Georgia in 1792 and served in local and state government before winning election to Congress. 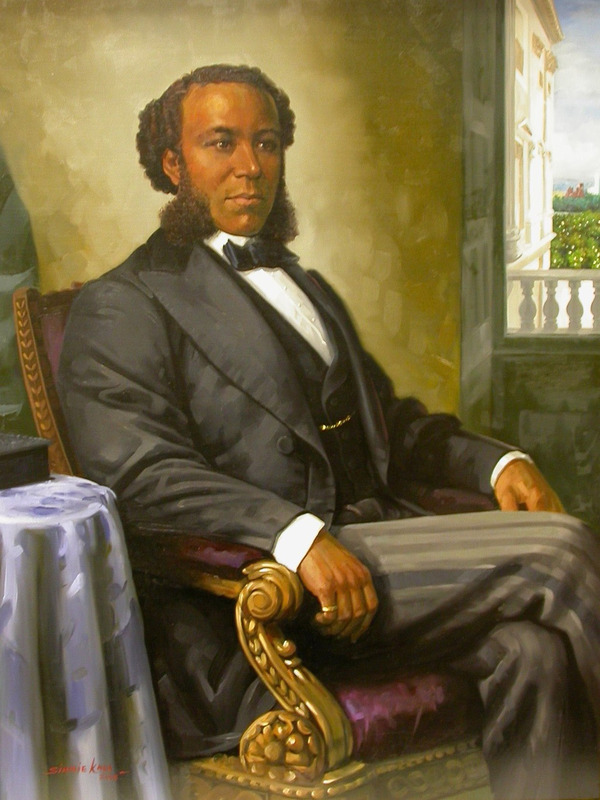 He represented Georgia in the House from 1811 to 1817 and moved to Alabama when he retired. 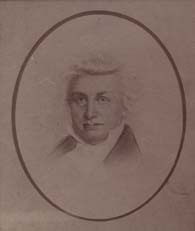 In 1824 he helped welcome Lafayette to the area during his nationwide tour. Hall died on his Alabama plantation in 1836. So there you have it: now we all know a little more about two worthy but otherwise forgotten members of Congress. 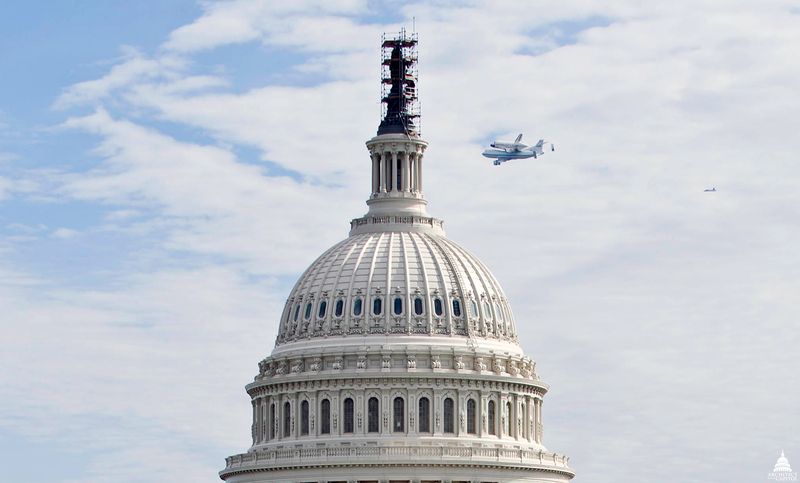 The recent dramatic flight over the Capitol and National Mall by the Space Shuttle Discovery on the back of a 747 reminded me of some other historic images of manned flight at, near, or above the Capitol. Perhaps the first instance of manned flight (okay, technically it wasn’t flight as the balloon probably remained tethered to the ground) in the nation’s capital took place in June 1861 when Thaddeus S.C. Lowe demonstrated his lighter-than-air balloon to President Abraham Lincoln. 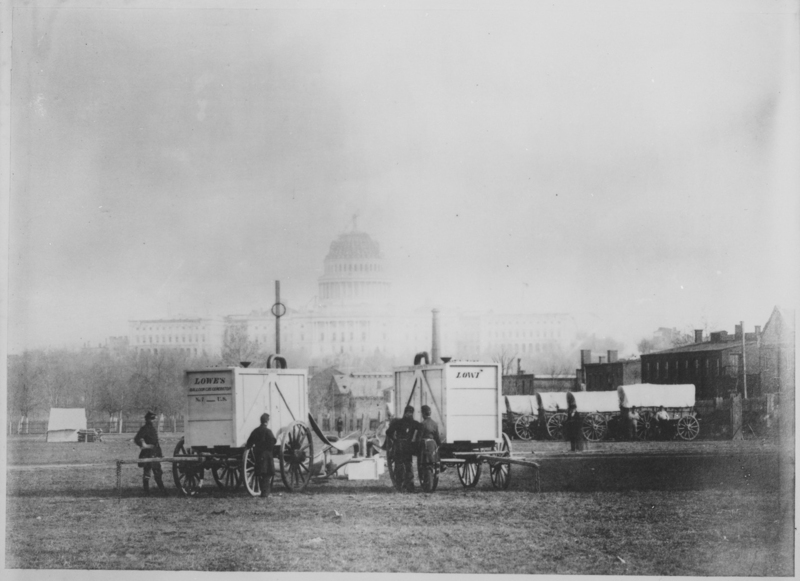 In this photograph, Lowe’s generators are seen pumping gas into the balloon prior to its ascension to a height of 500 feet with the U.S. Capitol in the background. 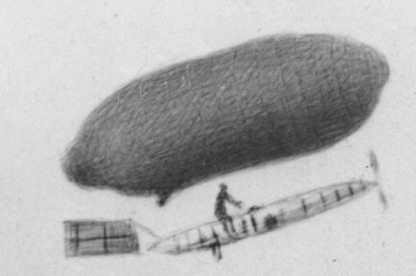 Lowe’s test ascension convinced Lincoln of the balloon’s potential for military reconnaissance. 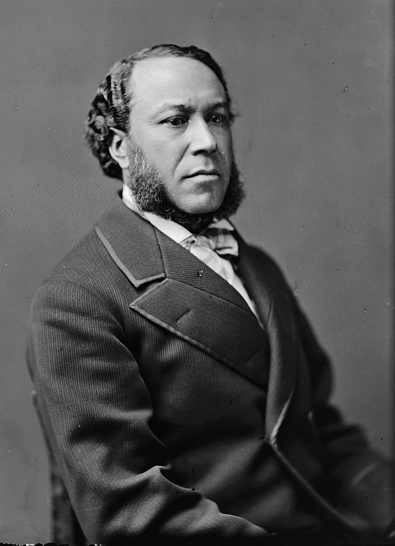 Lowe, who was often referred to as “Professor”—a title conferred on enterprising balloonists—was appointed chief aeronaut of the Union Army Balloon Corps. 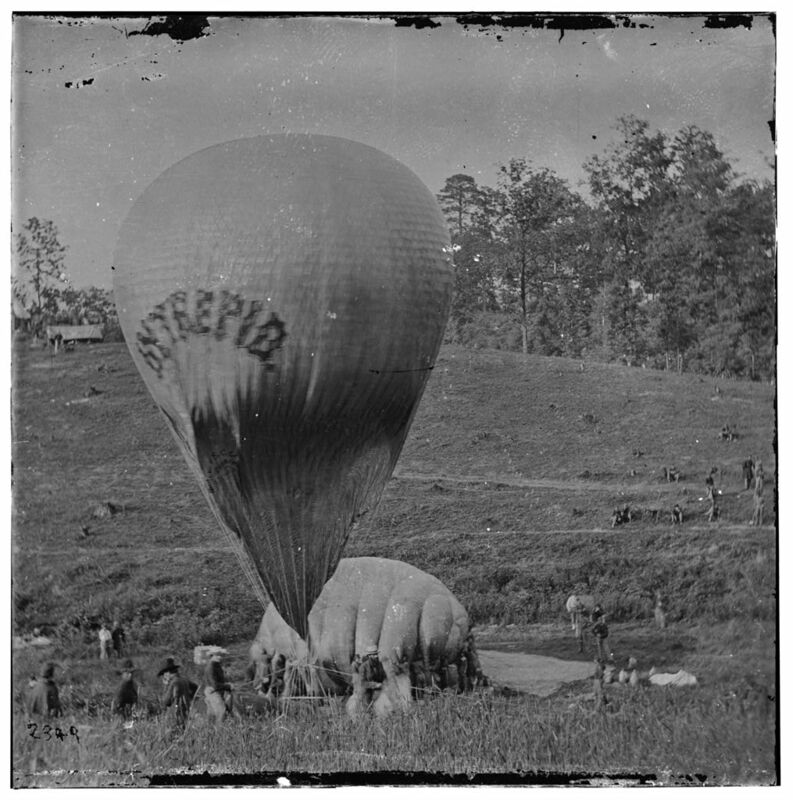 Here is a shot of Lowe’s balloon, the Intrepid, inflated and airborne in Virginia in 1862. 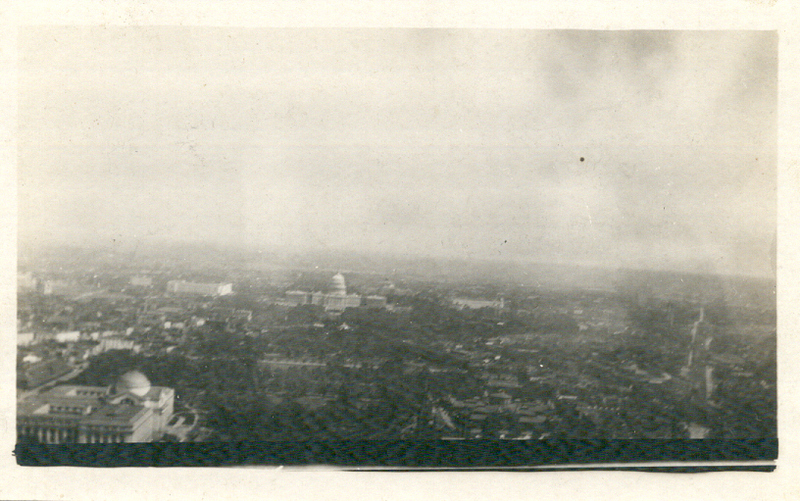 The next photograph that proposed to show manned flight above the Capitol is an enterprising fake. 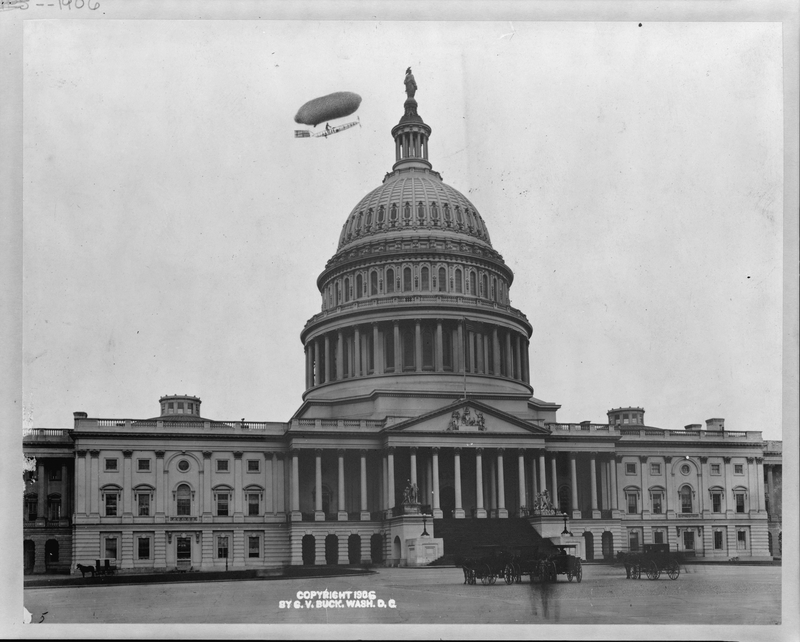 At some point, someone drew in an image of a flying apparatus suspended from a balloon above the Capitol in a 1906 photograph of the Capitol copyrighted by G.V. Buck. A blow up of the “flying ship” clearly shows that it had been penciled in. 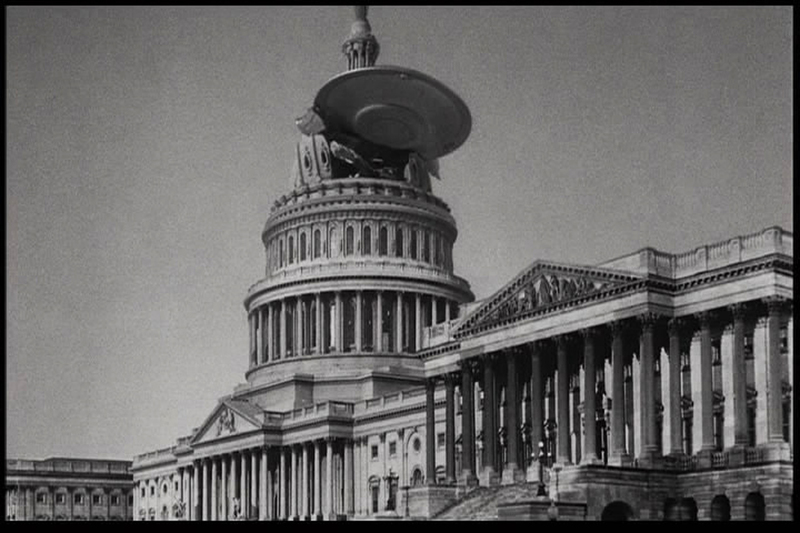 While we’re on the subject of fakes, let me include one of my favorites—the scene in the 1956 Columbia Pictures movie Earth vs. the Flying Saucers in which an alien spacecraft crashes into the Capitol Dome. Technically, of course, alien flying saucers don’t qualify as “manned” flight, but I couldn’t resist sharing this picture for those who haven’t seen the movie. There is a similar scene in Tim Burton’s hilarious 1996 parody Mars Attacks!, but the original is better, in my humble opinion. Special effects wizard Ray Harryhausen crafted the meticulous miniatures and stop action photography for Earth vs. the Flying Saucers. In a second post, I’ll present some photographs of zeppelins, blimps, and autogyros (what’s that?) flying over the Capitol. Stay tuned. How Many Modes of Transportation Can You Find? 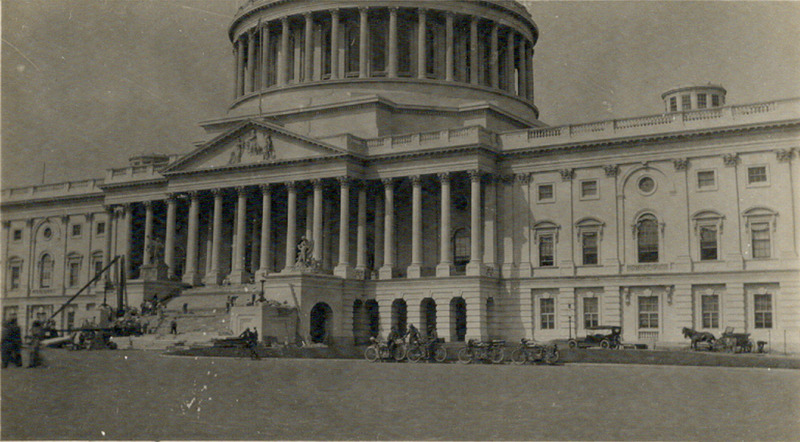 In 1914 while on a motorcycle trip to Washington, D.C., Lee Roy Stoner of Kingwood, Pennsylvania took the above photograph of the United States Capitol. You can notice some work being done to the east central steps, as well as several modes of transportation. We count five. How many can you name? We’ll give you two—motorcycles and walking. You may have to look closely to see the other three. Once you find ’em, shout out in the comments. 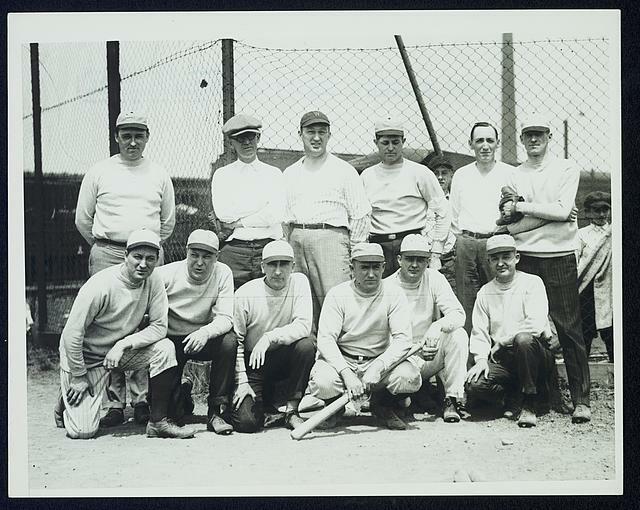 Many thanks to Mr. Stoner’s granddaughter, Kimmy Armstrong, for sending us this image along with two other photographs taken by her grandfather. Think you know the vantage point that made this picture possible? 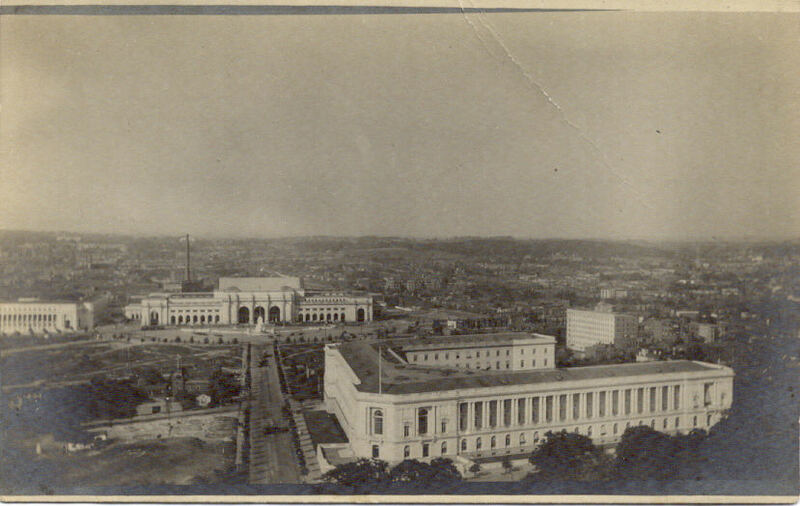 Know which building appears at the lower left? And where’d all those trees go? Let us know in the comments. The two main buildings pictured here today are still standing, though one of them looks a bit different now. What are they, and where did Stoner stand to get this shot? Give us your best guess in the comments! Gold stars to the first to figure it out (not including you, USCHS staff). We’ve run across this photograph a couple of times recently and wanted to share it with you. 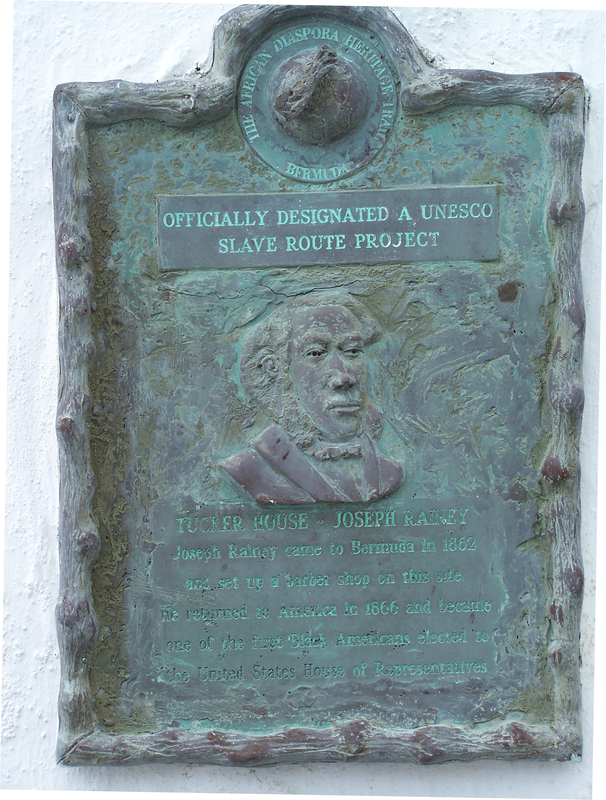 It neatly ties together some timely themes: Maggie Esteves’ post on Horatio Greenough’s statue of George Washington, the ongoing African American History Month, and Washington’s upcoming birthday (February 22). Photographer Frances Benjamin Johnston took this picture in the last decade of the nineteenth century as part of a survey of Washington, DC schools. According to the Library of Congress, Johnston was one of the first American women to gain prominence as a photographer. She was a portraitist as well as a photojournalist and used her family connections to Washington’s leading politicians, including the First Family, to launch her career. This image also hints at Johnston’s later interest in garden and estate photographs and her contributions to architectural surveys. Greenough’s statue of Washington exists at an interesting stitch in the American cultural fabric, trapped between the nineteenth century’s interest in classical iconography and its views of a beloved and idealized figure. This picture of the statue is especially interesting given Johnston’s choice to juxtapose the controversial statue and this group of well-dressed, clearly well-cared-for African American students. Immediately after the Civil War, there were efforts to educate freed enslaved people in the wake of the Civil War and include them in the political process; however, as the period of Reconstruction wound down after 1877, many of those efforts died out, Jim Crow laws became increasingly entrenched, and most white Americans consigned black Americans to what seemed to whites to be a fitting lesser existence and permanent underclass. The above image, then, may have surprised people who wrongly assumed that all descendents of enslaved people were inherently poor, slovenly, ill-mannered, and ineducable. 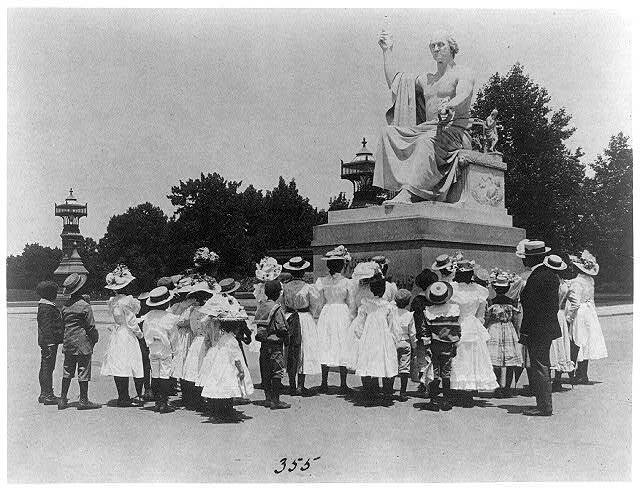 Here was a group of students visiting a depiction of the same Washington revered by white Americans. It also reminds viewers of the segregated schools in Washington (would black students have been able to visit a statue of Washington inside the Capitol or a museum?) while picturing black students who differed little from white students in appearance and exposure to or interest in American history (and thus perhaps hinting at the speciousness of many “reasons” for segregated education). On an entirely different and completely fluffy note, when I was younger I so wished that we still wore clothes like these! Blame Anne of Green Gables and her puffy sleeves, my love of skirts that twirled, and a thorough ignorance of the restrictions such clothes placed on girls and women. What do you see when you look at this picture? I wonder what those students and their teacher thought about and discussed as they viewed the statue. This photograph provides fertile ground for exploring some of the ways Americans have claimed one ideal while acting very differently in practice. I recently had the pleasure of sitting down with Congressman Jason Altmire (D-PA) for a conversation that will appear in our ongoing “Insider’s Guide to Capitol Hill” interview series after the New Year; however, something came up in the course of that interview that struck my interest and deserved some investigation. In recalling a story, the Congressman made mention of the so-called Rayburn “Board of Education” room inside the Capitol, which I had heard of but did not in fact know a great deal about. So, I hit the books to find out the history of this room, H-128, and to take a closer look at its relationship to Speaker Sam Rayburn (D-TX). The “Board of Education” room, as it is known in the Capitol, is tucked away on the first floor of the building and was a part of the 1857 expansion, originally housing the Committee on Territories until the late 19th century when the Journal Clerk and Committee on Elections moved into the space. So when and how did it come to be so closely associated with the Democratic delegation and leadership, specifically Speaker Rayburn? 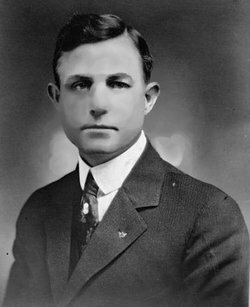 Since the time of Speaker Joseph “Uncle Joe” Cannon (R-IL) in the early 20th century, H-128 began to be occupied by Speakers, with Nicholas Longworth (R-OH) using it as a private conference room where he could have a drink during the Prohibition era with his friend and colleague John Nance Garner (D-TX), who would succeed him as Speaker. It was also at this point that H-128 was first dubbed the “Bureau of Education” by Garner, as the room would be used by the leadership to give new members an introduction to the rules and institutional procedures of the House. Once Sam Rayburn became Speaker of the House in 1940, the room got its current name, the “Board of Education,” later taking on his surname as well. He would gather there with the Democratic leadership to plot their strategy, in addition to gathering for drinks and poker games with a close knit group of members and even some reporters. The regulars in H-128 included Lyndon Johnson (who was a Democratic Representative from Texas from 1937 until he was elected to the Senate in 1948), House Parliamentarian Lewis Deschler, and Harry Truman, who would spend lots of time there as both a Democratic Senator from Missouri and later as Vice President. Congressman Altmire was in fact telling his story about Harry Truman and a momentous visit he had to the Board of Education room, but I will leave those details to when his interview is published in its entirety in the next few weeks so as not to give anything away just yet. At the time of the 1857 expansion that created this room in the Capitol, Constantino Brumidi’s assistant, James Leslie, was tasked with painting the ceiling and lunettes in H-128. During Speaker Rayburn’s tenure, a Texas “lone star” was added to one of the lunettes, perhaps officially marking this room as a Texas Democratic meeting place of sorts. In 2007, according to an article in the Houston Chronicle from that same year, the Texas Democratic contingent in the House were able to convince then-Speaker Nancy Pelosi to allow them to hold weekly delegation lunches in the historic room that is steeped in both Texas and House history. 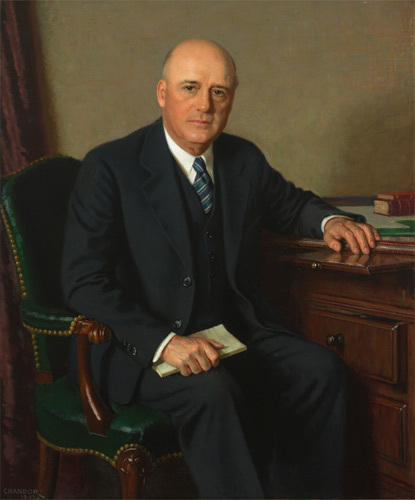 The portrait of Speaker Sam Rayburn hung in the Board of Education room until June 19, 1962 when it was taken down after his death and moved to the Speaker’s Lobby to join the collection of portraits of all past Speakers of the House that are kept there. After serving as Speaker longer than any other person in our history, Rayburn will also forever be linked to his Board of Education room where many a drink was poured and many a strategy plotted. H-128 is still considered one of the “Speaker’s rooms” and therefore not just for anyone to wander into or use as they wish; however, no matter what it used for in the future, its past will be forever linked with some of the most famous members to ever wander the halls of the Capitol. Make sure you stay tuned to our blog into the New Year to read the forthcoming interview with Congressman Jason Altmire (D-PA) to hear his insights and thoughts on a range of topics, including the conclusion to his story involving Harry Truman and the Board of Education room (and if you already know this story then keep it to yourself until after we post the interview!). Is there another room in the Capitol you’re curious about? Feel free to let us know and perhaps we can do some investigating or help to point you in the right direction. In the meantime, here’s to hoping all of you have a happy and healthy holiday season! 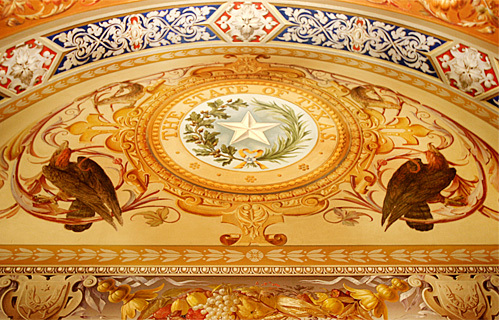 Office of the Clerk, http://artandhistory.house.gov/art_artifacts/speakers-rooms/board-of-education.aspx, (December 20, 2011). It’s a striking image, juxtaposing a physical manifestation of the promise of democracy and the hard facts of child labor. Lewis Hine took several pictures of these boys on April 11, 1912 as part of his work for the National Child Labor Committee (NCLC). The boys are 8 to 11 years old; these pictures are part of Hine’s series on street trades. The caption for a similar picture notes that the boys all live on the same alley in DC, and the oldest, aged 12 and not in the above picture, attended a “school for incorrigibility in school.” In general, a newsboy’s life was neither cushy nor musical; he usually had to buy his papers upfront and sell them all, and he worked at all hours of the day and night and in all weather. One of NCLC’s main concerns about this form of child labor involved the vices to which young boys were exposed–smoking, drinking, gambling, prostitution, and so on. 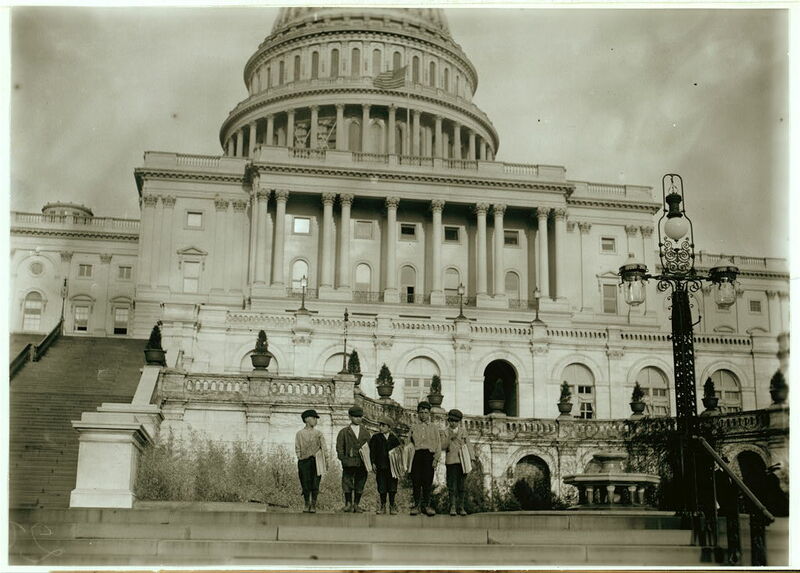 Many boys were key parts of their families’ financial support, and others were homeless. Hine was a proponent of photography used for education, and his photojournalism (an early example of documentary photography) was an essential component in the NCLC’s campaign to end the employment of children under age 16, especially in dangerous jobs. 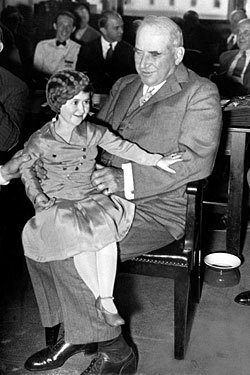 After a series of partial successes for the committee, the 1938 Fair Labor Standards Act prohibited the interstate trade of goods created through child labor; it remains a key part of the protection of American children. Hine’s images of children working in mills, mines, streets, and elsewhere introduced Americans across the country to the types of situations many children endured as part of a cycle of poverty.